Beautiful engraved RARE specimen certificate from the NBC Internet, Inc. . This historic document was printed by United States Banknote Company and has an ornate border around it with a vignette of the NBC company logo. This item has the printed signatures of the Company's President, Chris Kitze and Secretary. NBC Internet, Inc. (NBCi), a branded global integrated media company, commenced operations in November 1999. NBCi integrates major media platforms, including Internet, broadcast and cable television and radio, to deliver powerful ways for partners to connect with users and customers. NBCi's flagship mass media consumer Web site, Snap (http://www.snap.com), provides a comprehensive online experience to users worldwide via Internet search and directory, community, shopping, e-commerce, multimedia and entertainment services across all bandwidths. 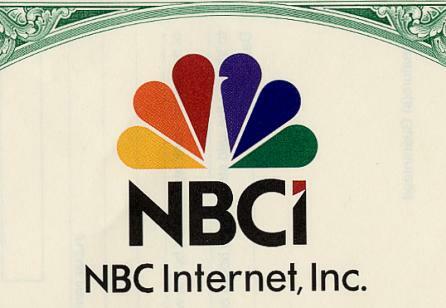 In February 2000, NBCi launched NBCi.com, a multimedia portal for broadband and high-speed users. 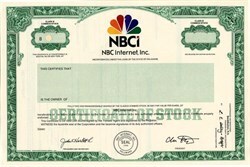 NBCi was created through the combination of Snap, XOOM.com, NBC.com, NBC Interactive Neighborhood, VideoSeeker and a 10 percent equity stake in CNBC.com. NBC Internet publicly trades under the ticker NBCI on The Nasdaq Stock Market (R). NBC, a subsidiary of General Electric Company (NYSE: GE), holds a 43.9 percent ownership stake in NBCi and brings to the venture the storied heritage of 70 years of branded media and technology innovations. NBCi is headquartered in San Francisco and has offices in New York City, Los Angeles, Chicago and Paris, France.